Being a Work at Home Mum is as much a curse as it is a blessing. We have all been there. The guilt of feeling like you are not able to give your all to either your Family or your Work. 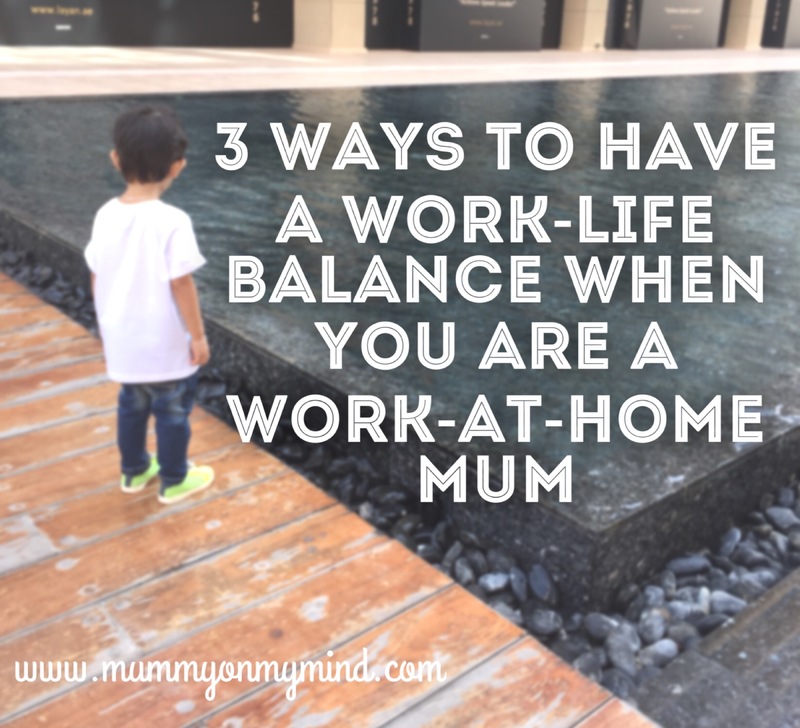 Being a Work at Home Mum means that the lines between these two duties are very much blurred, given that you are not following strict office hours and your work space may also happen to be where you sleep. This much coveted balance may indeed be something we all never reach, but we can surely tip the scales from time to time to feel a little less guilty, and a little more put together. I have already written about my decision to be a Stay at Home Mum, and since then I have started my blog, effectively now being a Work at Home Mum. Though I do not necessarily consist Blogging as my “Work”, it does take up a lot of time and effort, that which I have to fit into my full time role as Mother. As I immersed myself deeper in the blogging world, and wanted to excel at it, the cracks between my Work-Life balance began to show through as I struggled to keep on top of both. It was clear that some changes had to be made, for me to feel content within myself that I was doing as best as I could in both these fields. Since making these changes, I feel much more in control and much more balanced than I was before. So in hopes to help those who are going through a similar situation, I have compiled a list of 3 things that can help you achieve a better Work-Life balance. It is easy to be sporadic about your work when you do not have a strict schedule like your office working counterparts. Trying to fit in a deadline before meal time or five minutes before your child’s bath time. Let’s be honest, it is never JUST five minutes when work beckons. Therefore, you must allocate time that suits you and your child’s needs in a way that will mean you are giving your everything to the task at hand, whether that be work or mothering. Personally, I now dedicate mornings to Baby Z, getting house chores out of the way and then concentrating on spending quality time with my boy, whether it be an indoor activity or taking a stroll through our local park. After his lunch, I put Baby Z down for his nap, and that is when I put on my work cap, dedicating the afternoon to my blogging duties. Sometimes this stretched on to an hour or two after Baby Z wakes up again, but Daddy is normally home by then, and so I can pass on the parenting torch over to him. By allocating mornings to my son and the afternoon to my work, there is no guilt to be felt as both have been given individual attention. Working at home often means working from the bed, which in turn leads to never really “switching off” your brain from work related issues even when you head to bed for sleep. By having a space that you can dedicate as your office, you can ensure that “what happens in the office, STAYS in the office” and therefore mentally detach yourself from work related issues once you leave that space. Though, I would love to allocate an office room, we simply don’t have the space for it yet, and thus I have picked a corner of the dining table as my make shift office for now on which all work issues can be dealt with. Sitting on a proper table and chair also ensures better back posture as opposed to slouching on the bed. The sooner you learn to pick and choose, the better. Not all your work needs attending to there and then, or needs the same amount of time. Learn what needs your immediate attention, and what doesn’t, as well as what needs a quick five minutes and what will take a good hour to complete properly. Personally, I like to club together tasks that I think are similar, so I can get them done more efficiently. I have also learnt that I need not attend every event or reply to every query that comes my way, if it is not worth my time. Ruthless it may be, but it ensures you get the maximum output from whatever you put your energy to. Realise your worth and realise what needs your time. Having said all this, not every day will go to plan and there will still be days when things don’t work out and your balance tips one way or the other. That’s the joy of parenting, and also what makes working from home a treat because you are your own boss. However, by putting these practices in place and making it a part of your working habit or routine, you can ensure a smoother work-life balance overall. Please do share any tips and tricks you have for a better Work-Life balance in the comments section below, as I would love to hear them! Note: A version of this post was first published on BizMomFinder here.